David Lin, a Taiwanese-American, commissioned a political mural that has drawn the ire of Chinese officials. Despite pressure, Lin says he will not remove the mural. The Chinese government has asked a small city in Oregon to remove a mural that depicts Chinese riot police beating Tibetans and Buddhist monks immolating themselves in protest of Chinese rule, the Corvallis Gazette-Times newspaper reported. Officials from the Chinese Consulate General in San Francisco wrote to Mayor Julie Manning of Corvallis, Ore., urging her to act to remove the mural. "To avoid our precious friendship from being tainted by so-called 'Tibet Independence' and 'Taiwan Independence,' we sincerely hope you can understand our concerns and adopt effective measures to stop the activities advocating 'Tibet Independence' and 'Taiwan Independence' in Corvallis," said the letter, dated Aug. 8. "There is only one China in the world, and both Tibet and Taiwan are parts of China,” the letter said. “It is a fact recognized by the U.S. and most other countries in the world." 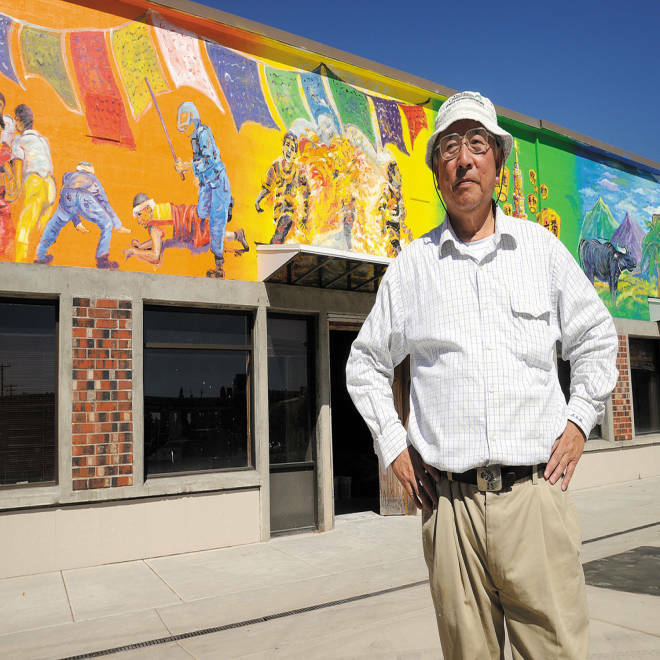 The mural was commissioned by David Lin, a Taiwanese-American businessman who owns the building on which it is painted. The mural, which measures 100 feet by 10 feet, is brightly colored and also includes landscapes and Tibetan prayer flags. China has effectively ruled Tibet, which borders on India, since its military invaded in 1950; Beijing claims it has historical sovereignty over the Himalayan region. Beijing also lays claim to Taiwan, which it considers a breakaway province. The Chinese government aggressively battles efforts to promote independence—in reality or perception—of both. Manning refused to have the mural removed, citing freedom of speech. Plus, she said, it’s a private building over which city officials have little say. Last week, following the mayor’s refusal, two Chinese officials flew up from San Francisco to meet with Manning and the city manager. Corvallis is about 80 miles south of Portland, Ore., and has about 54,500 residents. About 1,600 Chinese students attend Oregon State University there. For the city officials, the discussion was about freedom of speech. But for Lin, the businessman, the conversation has become personal. He told the Gazette-Times that relatives worried they could be arrested if they traveled to China. But for now, Lin, who moved to the U.S. in the 1970s, told the newspaper that he intends to stand up against Chinese authorities. NBC's Kari Huus and Reuters contributed to this report.